If you want to see the service mode when other modes are displayed, press the ▲ or ▼ button less than 1 second. 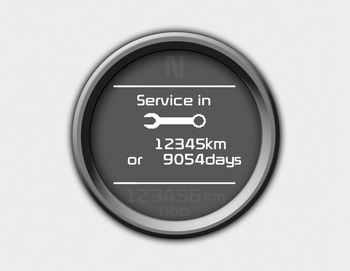 If you do not have your vehicle serviced according to the scheduled maintenance service on the LCD display, this LCD display will show the elapsed mileage or days. - Press the button more than 5 seconds. - " : Reset" will be shown on the LCD display. - Press the button again more than 1 second. If you do not press the button within 5 seconds, " : Reset" will disappear. If you want to change the interval of the maintenance service schedule, we recommend that you consult an authorized Kia dealer. If you reset the maintenance schedule, when the displayed service schedule has not elapsed or elapsed without actual vehicle service, the displayed service schedule on the LCD display might not be match the actual service schedule anymore. You should comply with the displayed service schedule on the LCD display for the maintenance of your vehicle. If the battery is disconnected or discharged, the displayed service schedule might not match the actual service schedule. If service mode is not activated, the LCD display shows, like the above picture. In this case, we recommend that you consult an authorized Kia dealer.